The world’s silicon industry is aiming at rapidly increasing production in Iceland. 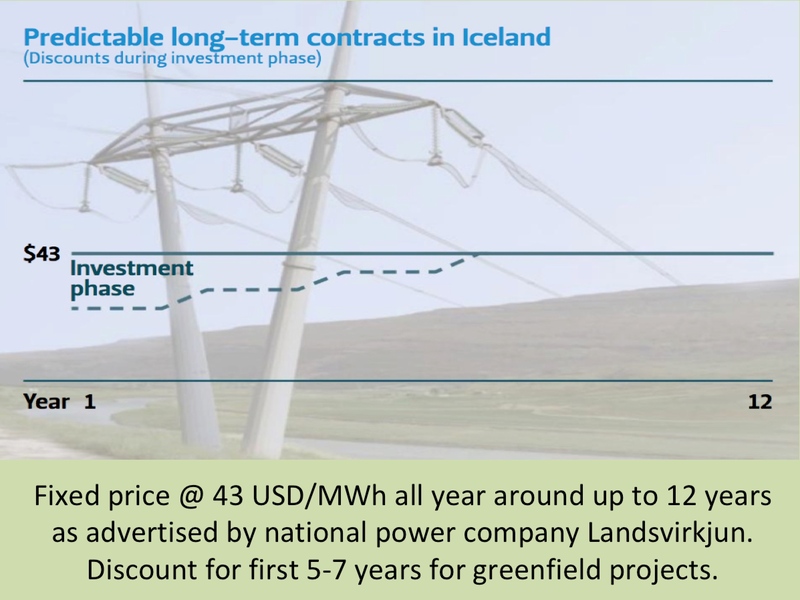 This is unerstandable, as Landsvirkjun (the Icelandic National Power Company) offers very competitive electricity prices and better opportunities for long-term contracts than can be found elswehere in Europe or even in North America. At the same time, Landsvirkjun is diversifying its customer base in very positive way. Today we will be looking at the growing silicon industry in Iceland. In last March Landsvirkjun signed a power purchase agreement with United Silicon; a new company established by a conglomerate of silicon industry participants in Europe. Under this agreement, Landsvirkjun will provide electricity to power a metallurgical grade silicon metal production plant being built by United Silicon in Helguvík in Southwest Iceland. The 20,000 ton facility is scheduled to commence operations in early 2016 and will require 35 MW of power which will be derived entirely from the renewable energy sources of Icelandic hydro and geothermal. During the past year, United Silicon has been evaluating several sites around the world to establish its new silicon production facility, there amongst in the Middle East and Malaysia. Because of the excellent conditions in Iceland, it was decided that Helguvík would be the right location for the plant. The construction of the plant is expected to start already this summer (2014). Arion Bank will be financing the project, which is expected to take place both through a senior loan as well as junior bond. The Icelandic TSO Landsnet has signed agreement with United Silicon regarding transmission of the energy to the upcoming plant. Earlier this year, the Icelandic company Thorsil and Icelandic engineering firm Mannvit signed an agreement for the engineering of a silicon metal plant that Thorsil intends to construct and operate in Southwest Iceland (at the same location as United Silicon). The plant may need close to 85 MW of power. In December 2013 Thorsil increased its share capital in order to finance this part of the project. That same year Thorsil and municipality of Reykjanesbær signed a contract for the 16 hectare plant site at the industrial and port area of Helguvík. The plant’s environmental impact assessment (EIA) is under way. Construction og the facility is set to start in late 2014 and scheduled to commence operationsin late 2016. The plant will have an annual production capacity of 54,000 tons per year. Roughly 300 people will be employed during the construction phase. Some 160 new jobs will be created once the production is up and running (in addition to jobs at related service providers and vendors). In last March (2014) Icelandic National Power Company Landsvirkjun and PCC Bakki Silicon announced a power purchase agreement for a new metallurgical grade silicon metal production plant. The plant will be built by PCC close to Husavik in Northeast Iceland. PCC is a German industrial group, operating in 16 countries. The three main divisions of the group are chemicals, logistics and energy. Production in the new plant at Bakki is estimated to start in early 2017 and will produce up to 36,000 tons, using 58 MW of power which will mostly be derived from renewable geothermal power in Northeast Iceland.The contract is subject to certain conditions set to be finalised later this year. The energy for the plant will be delivered by the Icelandic TSO Landsnet, as already has been negotiated between Landsnet and PCC. The US company Silicor Materials has signed terms of a contract to build a solar silicon factory at Grundartangi in Soutwest Iceland. Silicor Material is a leading manufacturer of high-quality solar silicon, currently powering more than 20 million solar photovoltaic cells for customers around the world. The Icelandic plant is expected to produce up to 16,000 tonnes of solar silicon annually (for solar panels). This investment will be close to 700 million USD and the plant will employ more than 400 people on completion. The construction of the plant is expected to start later this year (2014) and be operational in 2017. Although it has yet to be seen if all the projects above will be realized, there is obviously great interest in the silicon industry to gain from the positive location and business environment in Iceland.